I read a lot about fast cars, and I like to drive as many as I can. I also listen to a lot of TV , radio, and podcast shows about cars, and one of them made a point that seems so simple, but yet so correct, that I really wish I’d thought of it. Ah well, I’ll just steal it! Go ahead….stand on it. You and the Mustang will both love it! What’s the point? Well, when it comes to driving an old muscle car there is something completely visceral about it. Driving a bone stock ’65 Mustang at 110mph is a completely different experience than driving a new Honda Accord at 110. It seems a lot faster in the Mustang. It’s louder. It’s less stable (way less). It’s working harder. It’s also a lot more fun….and you feel completely alive! How can all of these feelings come from driving one 45 year old car? Well, for starters, the Mustang (or any old muscle car really) started with the bones of a passenger car that was retrofitted for speed duty. It was designed to be a regular car – not a speed demon – until GM, Ford, Chrysler, and AMC repurposed them. They may or may not have seat belts, and they definitely didn’t come with airbags, anti lock brakes, or (depending on the year) even a collapsible steering column. If you wad the thing up at high speed your chances of going home in a body bag are much (and I mean MUCH) higher than the Accord. 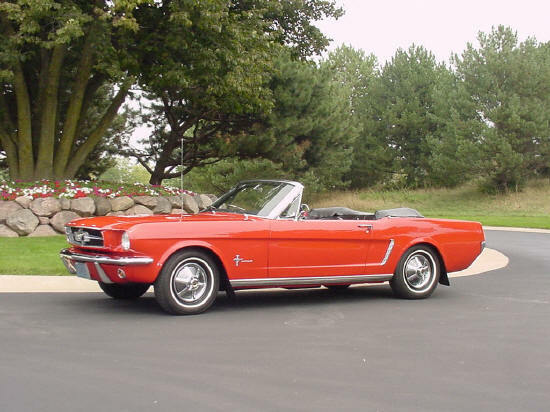 That being said….there is something very impersonal about the modern safe car vs the old Mustang. The Mustang has personality. It has quirks. It seems alive. Driving it makes you realize there is a difference between men and boys, and you’re the man behind the wheel. Driving it hard is thrilling and terrifying all at the same time…..and there isn’t a man alive that doesn’t want that experience at least once in his life. If you’ve got an old muscle car, drive it hard – at least once. If you’re buying one to hang on to – do the same anyway. You won’t regret it. Just don’t wreck it. Ejoyed the artical, brought back memories of the Mustangs I have owned and towed a lot of Honda Accords with them.